Between the Hottentots Holland mountains in the east and Table Mountain in the west is a low-lying sandy region which was once submerged by the sea. 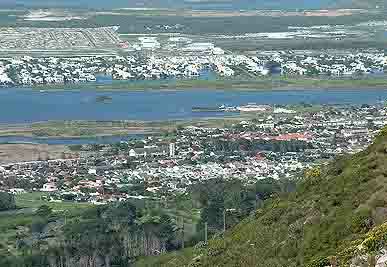 It is known as the Cape Flats and today is home to a large wetland area which consists of a number of lakes and marshes which we will discuss below. Way back in the times of Jan van Riebeeck (1650”s) the Zandvlei marsh was known as the Zand Vallei or Sand Valley. In those days the water in the marsh used to dry up during the summer months leaving a huge sand valley in its place. It was only in 1743 when Wynand Muys was placed in charge of a cattle post on the banks of the Zandvlei that the area got its name of Muysenberg which today has been corrupted to Muizenberg. In 1795 Zandvlei had an estuary which was fed by the sea during tidal changes, while higher up in the marsh water entered from the surrounding rivers and formed two distinct areas, one with fresh water and the other with salt water . During the rainy season when the upper marsh overflowed the fresh water would drain through the estuary to the sea. Over the years the marsh has had many uses and as far back as 1894 was used for recreational purposes by the Table bay Boating Assiciation. Then in the late 1800's a railway line was built through the north west section of the marsh dividing it into what is today known as the Westlake wetlands and the current Zandvlei. At the time the cut off area of the marsh was known as Swartgronddraai (Black soil corner) and today forms the boundary where the mountainous soil and the sandy soil of the Cape Flats meet. While building the railway line the authorities also decided to canalise the mouth of Zandvlei causing the vlei to become one large body of water instead of the two sections it had been before. During the 1950's further changes took place when the Cape Town City Council decided to dredge parts of the vlei making channels around the Lakeside train station and establishing parklands along the west bank of the vlei by dumping the soil dredged out of the canals there. In the 1970's a housing estate named Marina da Gama was planned for the eastern bank of Zandvlei and dredging took place to create the canals on which the housing would be built. 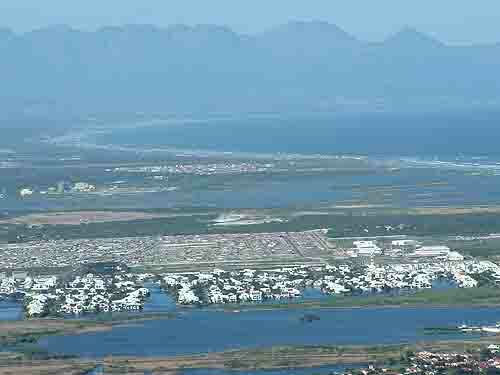 In the process Park Island was built to repay the general public for the loss of the eastern banks of the vlei which were being used for the marina. Today Marina da Gama is a fully functional residential area with hundreds of houses built along its canals. Unfortunately many of the original plans for the Marina never came to fruition. A waterway to the sea from the marina was never completed and the mouth of the vlei is kept blocked with sand to keep the water levels in the vlei constant. In the winter months at spring tides the mouth of the canal is opened to allow much of the fresh water that has accummulated in the marsh to run into the sea and to be replaced with salt water so as to keep up the salinity of the marsh and to allow salt water fish spawned in the marsh to escape to the sea. Once the tide has moved in and filled the vlei the mouth is once again closed by bulldozers filling the mouth with sand. Today the vlei is used by yachtsmen and canoeists for recreational purposes and anglers try their luck from the banks of the vlei. Next time you visit the Muizenberg area why not stop off at the marshes in the area and explore them for yourselves. Princess vlei nearby provides some interesting fresh water fishing and from time to time produces some really large carp. The largest of these marshes is Zeekoeivlei (Hippopotamus marsh) which is about 256 hectares in size and averages about 1.9 metres in depth when full and drops by about half a metre in the summer months. This fresh water marsh once was home to hippoptamus but is today a recreational area used for watersports such as yachting, speedboating and water skiing. During the winter months when the Cape receives its rain the Big Lotus and Little Lotus rivers both empty themselves into the marsh which when full overflows into a canal which takes the excess water to the sea. A second marsh named Rondevlei can be found quite close to the Zeekoeivlei marsh. It is approximately 2,2 square kilometres in size and consists of mostly permanent wetlands. Rondevlei is an important bird sanctuary and in it can be found about 230 different species of birdlife and includes birds such as flamingos and pelicans. There area a number of islands on the vlei which are used as breeding sites by the birds. Also found in the vicinity of the lake are a variety of small animals such as the caracal and porcupine. The only larger animal is the hippopotamus which was reintroduced to the Cape in 1981 in an effort to control an alien grass species that originated from South America. One of the younger male hippos was bullied by a larger hippo and escaped from the Rondevlei reserve. “Houdini “ as he was named was missing for about 10 months and was eventually discovered in a lake nearby where he was captured and removed to the Eastern Cape. Rondevlei is surrounded by the threatened Strandveld and Sand Plains fynbos vegetation which only has 3% of its original distribution left. Many of the plants in the fynbos are unique to Cape Town and are found nowhere else in the world. There is such diversity in these marshes that a visit to them is something you should think about when visiting Cape Town.